ReNu Multi-Plus Solution Triple Pack is an exceptional multi-purpose solution, for everything you need in one bottle, now available in a value pack for even greater savings. Made by renowned manufacturers Bausch & Lomb, the solution is compatible with all soft contact lenses, including silicone hydrogel lenses. Enjoy a high level of cleaning and comfort with ReNu Multi-Plus Solution Triple Pack. The solution has been made with a Poloxamine active agent that works to clean, loosen, and remove build-ups of deposits, film and debris on your contact lenses. At the same time, Hydranate is a protein remover that also enhances wettability for both a smooth and healthier lens wearing experience. 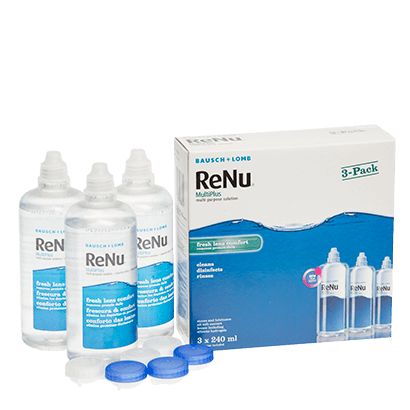 ReNu Multi-Plus Solution Triple Pack arrives in three 240ml bottles, alongside three contact lens cases. The solution can be used with a rub routine and is most effective with daily use. Rely on an effective eye care routine at FeelGoodContacts.ie for the most affordable price. If you have sensitive eyes, why not try ReNu Multi-Purpose Solution for an even more gentle formula? You get what you pay for as they say, this solution keeps lenses like new! I prefer this solution to the Sensitive version, I feel it cleans my lenses more thoroughly. Also, for some reason I actually feel the Sensitive one actually make my eyes sore, while this one doesn't. Also, I liked that if FeelGood doesnt have them in stock they immediately let me know and sent me 1 large bottle of another brand for free until they got the stock back for this product and sent me my order. Very pleased. Used ReNu Multi-Plus solution for years - excellent. The triple pack means I always have some in stock so I don''t run out. One of the best cleaning solutions I ve used for years. I''ve been using this for several years and can''t find anything anything like as good. Good solid lens solution. Very comfy and cleans well. This is a great product which keeps my eyes feeling fresh all day.